You’re bound to find something you’ll love on our menu. From out of this world seafood dishes to our amazing slow roasted ribs, we’ve got a wide variety that’s sure to please. 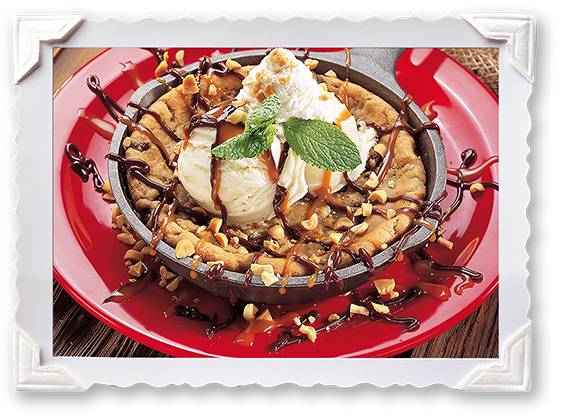 We use only top-quality ingredients in everything we make, from our abundant salads to our memorable desserts. 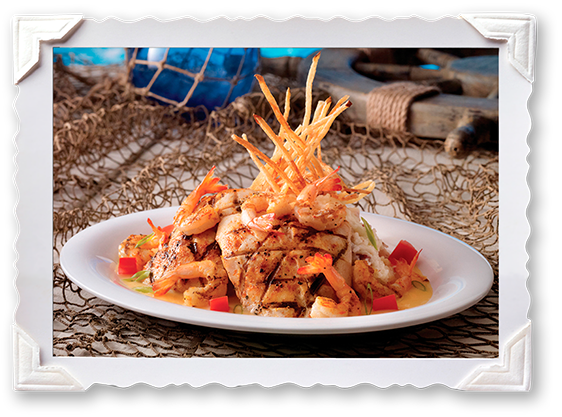 Of course, we’ve got shrimp the way you like it too. Come in for a fun experience and a great meal soon. 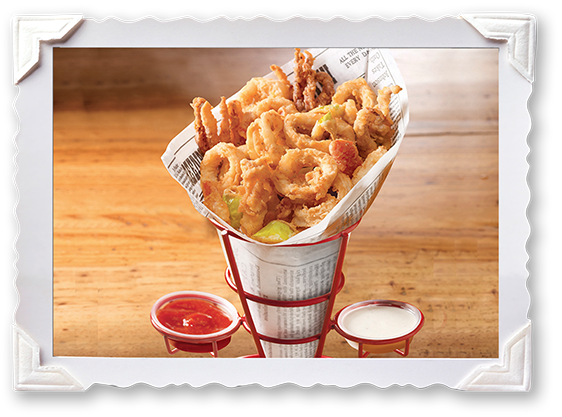 Hand breaded Frizzled Onions, fried to golden brown, served with BBQ, Ranch and Chili Ancho Dippin’ Sauces. Our best Peel ‘n’ Eat Shrimp steamed in Beer. Choose from Bubba’s Garlic Spice or Secret Recipe Cajun Spice. Shrimp marinated in Lime Juice and mixed in a fresh Tomato, Onion, Cilantro and Avocado Salsa with plenty of Tortilla Chips to share! We also have Fish Ceviche available. Southern cookin’ meets the sea! Noodles mixed with sautéed Shrimp, Cheddar, Monterey Jack and Parmesan Cheese. Topped with golden brown Bread Crumbs. Not quite Hush Puppies – we make ‘em better! 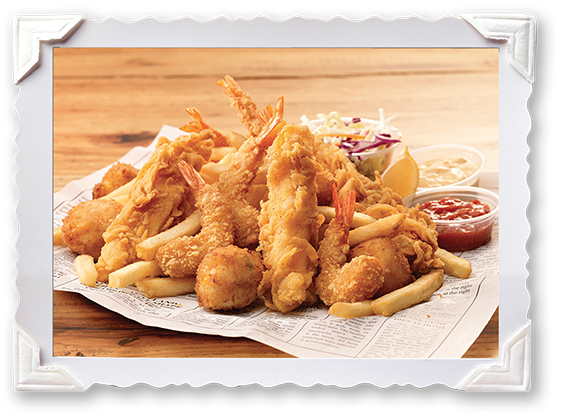 Tasty Shrimp and Fish with golden Corn, deep fried and served with a Remoulade Dippin’ Sauce. Lots of Cajun spiced Chicken Strips with Blue Cheese Dippin’ Sauce. Sautéed in a hot and spicy Cajun Butter Sauce. Served with Garlic Bread for dippin’. 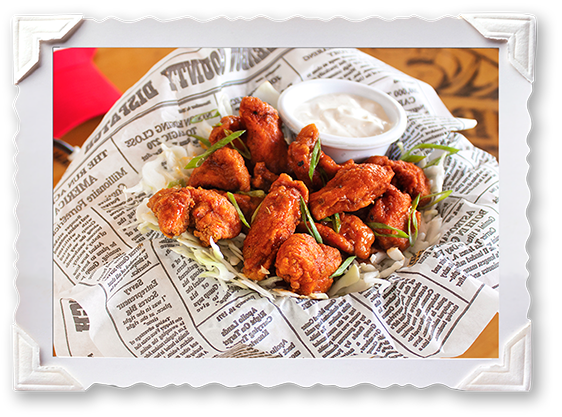 Spicy Chicken tenders, BBQ Ribs & Beer Battered Fried Fish served with French Fries & Ranch Dressing for dippin ́. An authentic spicy recipe from our staff in the French Quarter. Lots of tender Shrimp sautéed in Butter, Garlic and Spices, served with Jasmine Rice. Four tacos of breaded Shrimp, Guacamole, Pico de Gallo and other special Sauces! Or try them with a lightly breaded Fish instead of Shrimp! Forrest’s favorite meal after a day on the boat! Southern Fried Shrimp, Seafood Hush Pups, Fish & Chips. And don’t forget the delicious Sauces for dippin’ – Tartar, Cocktail and Remoulade. With hot and crispy Fries and Cocktail Sauce for dippin’. 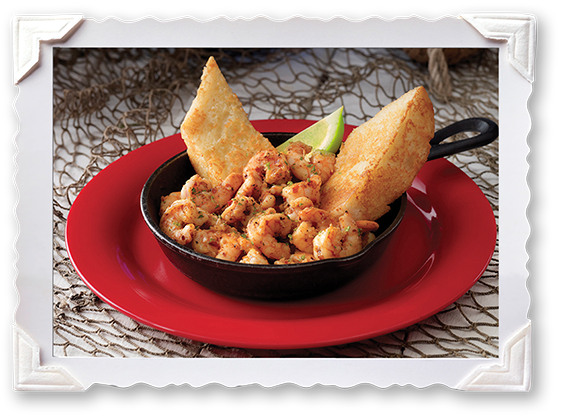 Tender Shrimp in a mild and creamy Chipotle Pepper Sauce, sprinkled with Parmesan Cheese. Served with Jasmine Rice and Garlic Bread. “…Of Course We Have Scampi! Boneless Breast of Chicken, fresh golden Corn and Mashed Potatoes with Gravy… better than you can imagine! Tender and juicy Churrasco Steak grilled to perfection with Mashed Potatoes. Tender and juicy Churrasco Steak with succulent grilled Shrimp and Fries. 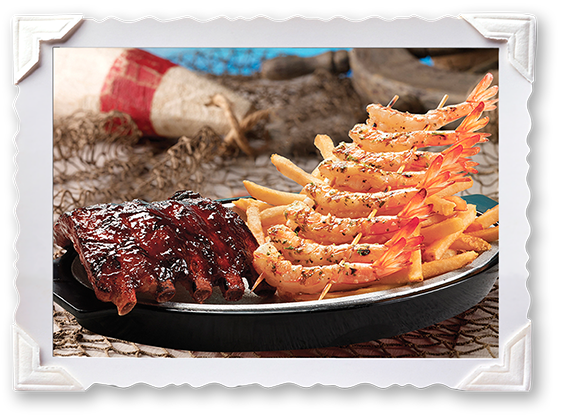 Half Rack of our award winning Dixie Style Baby Back Ribs, slow roasted to perfection along with succulent Grilled Shrimp and French Fries. 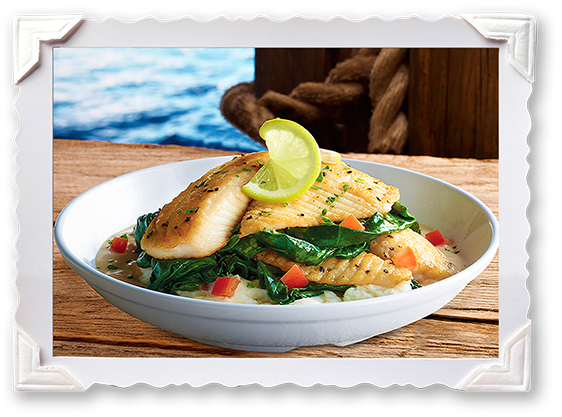 Fresh Tilapia laid over Mashed Potatoes with Sautéed Spinach and a creamy Lobster Butter Sauce made from scratch. Clam Chowder with Caesar or House Salad. 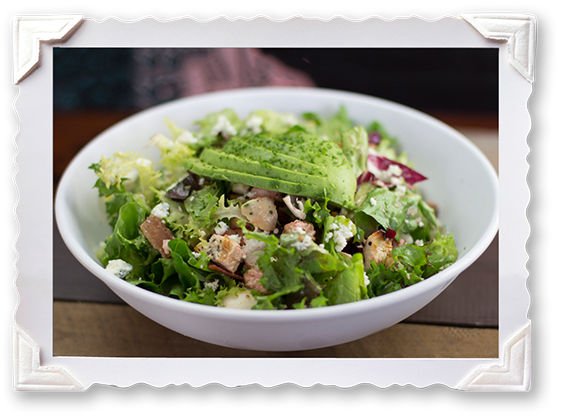 Grilled Chicken tossed with fresh Spring Mix and all the good stuff… Roma Tomatoes, Gorgonzola Cheese, Hard Boiled Eggs, Bacon, Avocado and Raspberry Vinaigrette. 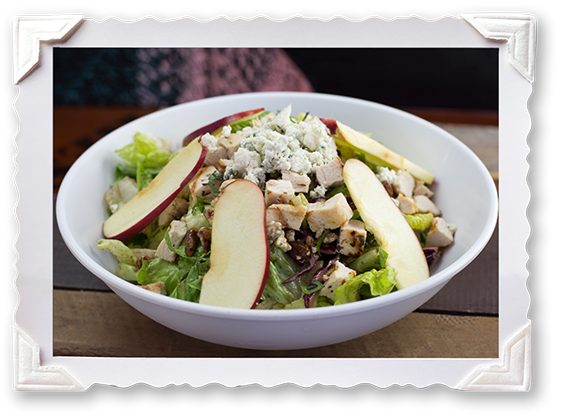 Chilled Mixed Greens tossed with grilled Chicken, Pecans, Basil, Gorgonzola Cheese and Balsamic Vinaigrette. 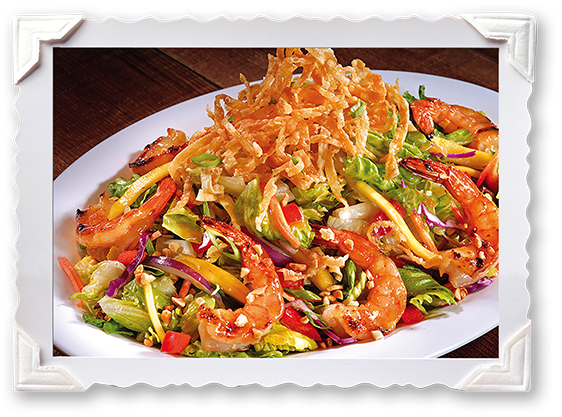 Tender Shrimp, fresh Greens, tropical Mango, Peanuts, tangy Asian Wasabi Dressing and crispy Wonton strips! Make it a Cheeseburger for – more. A big sandwich with big flavor. 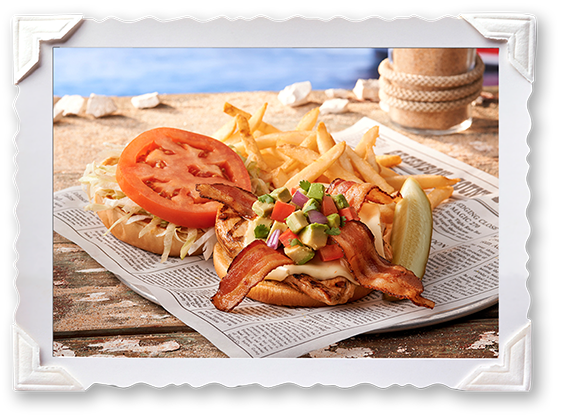 Cajun grilled Chicken Breast, crisp Bacon, Pepper Jack Cheese, fresh Guacamole on a toasted Bun with Fries. 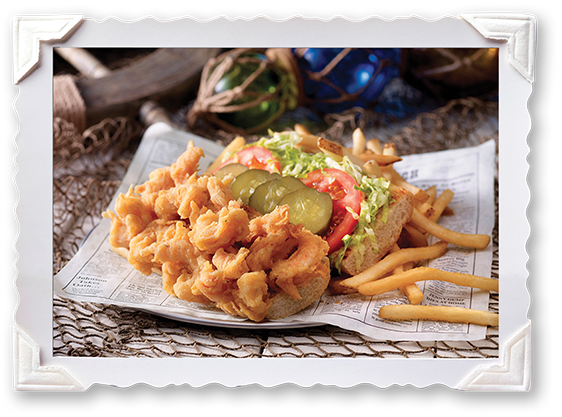 Just like the ones in New Orleans… French Loaf stuffed with warm Popcorn Shrimp! Served with Fries. 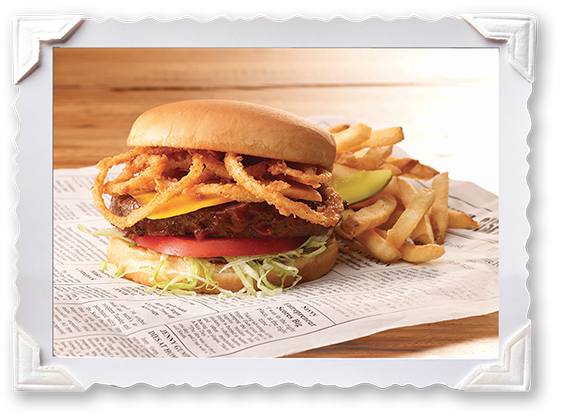 Our Burger topped with BBQ sauce, Cheese and Frizzled Onions. Served with Fries. Forrest and Lt. Dan had one every day! 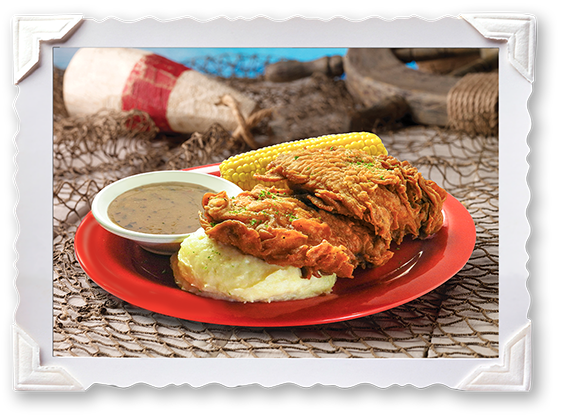 Your choice of a Southern Fried or Charbroiled Fish Sandwich with Louisiana Special Sauce and Pepper Jack Cheese. Served with Fries. 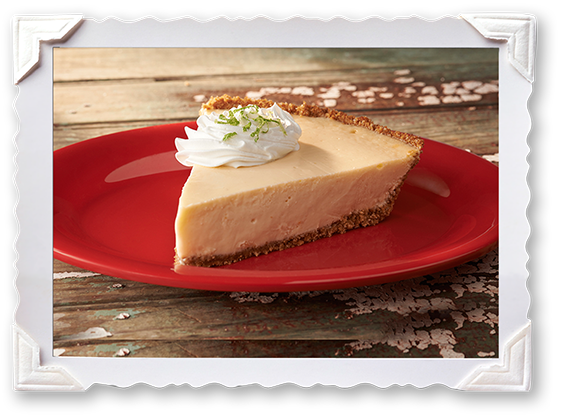 Mama’s secret recipe is the perfect finish for your meal. No one made it like Mama, because no one had her special Vanilla Sauce recipe! 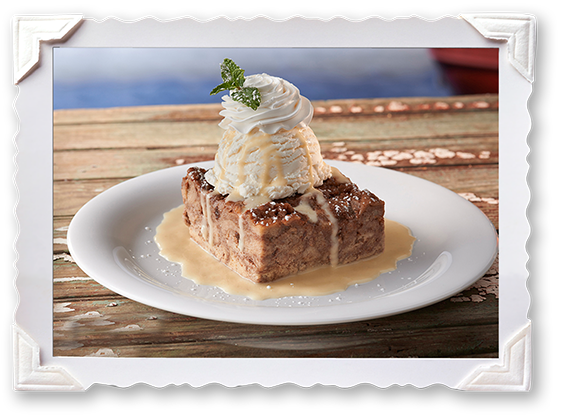 Absolutely, positively, the best Bread Pudding you ́ve ever tasted! 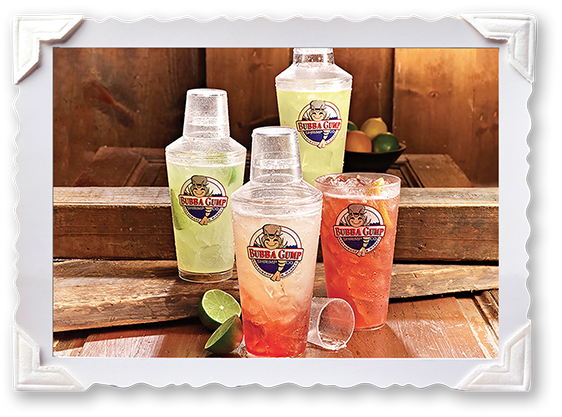 A refreshing blend of spiced rum and peach liqueur, tropical juices and lemon-lime soda. A refreshing blend of vodka, Mango puree, Apple Juice, Orange Juice and Granadine. The Southern classic. White rum, tropical juices, Cointreau and spiced rum adds a kick to make you feel right at home. 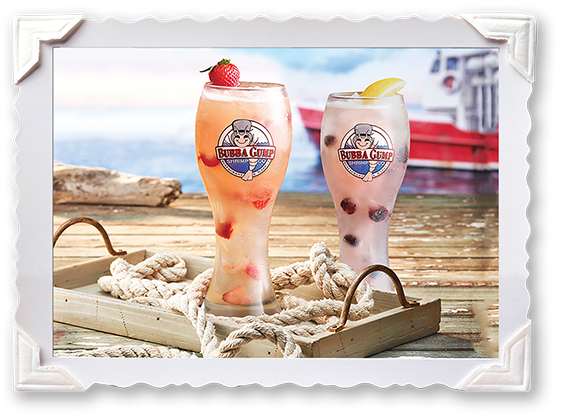 Our signature Hurricane Glass is Yours to keep! We combine some of the best gold tequila, pomegranate liqueur, sweet & sour and triple sec. All Hand Shaken! And you get the shaker to take home! Gold tequila, wildberry puree, ginger liqueur & topped with Coronita Extra® beer. We prepare it the original way using platinum rum, fresh mint, sugar and soda. Refreshing as an ocean breeze. Vodka, tropical fruit juices and fresh lemon juice. A tropical and refreshing blend of vodka, rum, gin, pineapple juice and blue curacao, topped with lemon-lime soda. Aloha! Coconut rum, mango liqueur, melon liqueur, orange juice and other refreshing tropical juices. Just the right summer sizzle! Raspberry liqueur, rum, gin, blue curacao, sweet & sour topped with lemon-lime soda. Mangos are loaded with Iron and Vitamin A. Slipping some into lemonade with a splash of orange juice was Mama’s secret recipe. Slushy-frozen sweetness — Choose Pink or Blue. Our incredible Piña Colada with a swirl of mango. Made with rum, our creamy tropical Piña Colada erups with a strawberry swirl. You will want to get up and Dance!! Peach Liqueur, Controy, Orange, Raspberry, Pineapple Juice and Lemon-Lime Soda. Relax – we’ll bring the beach to you! Our traditional Margarita with a squeeze of lime is topped with a Coronita Extra® beer, making this an extra special treat. Your choice — strawberries, blueberries or wildberry. We begin with gold tequila, triple sec, fresh squeezed lime juice and sweet & sour mix. 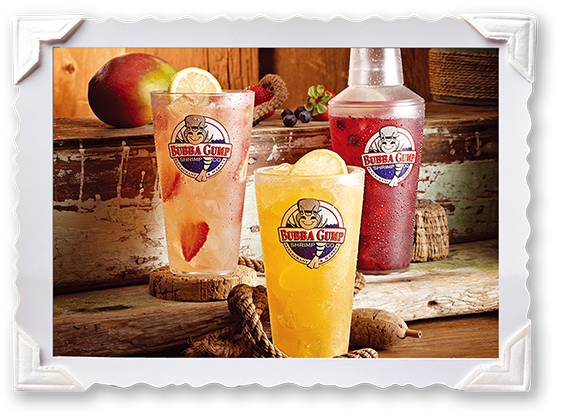 Add the refreshing crisp flavors: strawberry, mango, tamarind & guava. Nothing refreshes like our Speckled Lemonades! Made with rum or vodka, your choice of strawberries or blueberries.